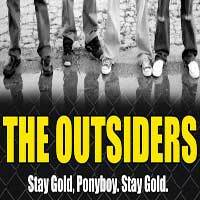 The stage version of the classic young adult novel The Outsiders is seen through the eyes of Ponyboy, a Greaser on the wrong side of the tracks who is caught up in territorial battles between the have-it-made rich kids, The Socs, and his tough, underprivileged family and friends. As these young people try to find themselves and each other, the sadness of sophistication begins to reach them and change them. SE Hinton's book comes to the La Mirada Theatre for the Performing Arts.